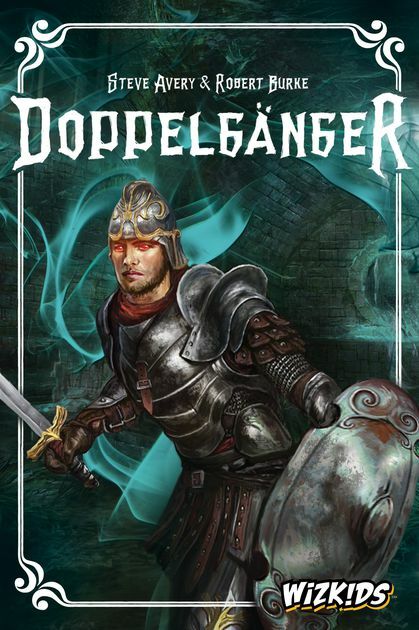 Doppelgänger from WizKids Games is a hidden role game in which a party of intrepid adventurers sets out to acquire the 3 Artifacts of Light…but one or more of the party is not as they appear. The Loyal Adventurers must discover the poser(s) in their midst and either eliminate them or acquire the 3 Artifacts of Light in spite of them. If you’ve played The Thing: Infection at Outpost 31, then you’ve already got a decent feel for the gameplay of Doppelgänger, but there is enough variance between the two that they are definitely distinct plays. Each player begins by selecting the equivalent to a class from D&D or Pathfinder: Rogue, Cleric, Barbarian, etc; each with a unique power for use during play. Then Loyalty cards are dealt to each player that will label them permanently as either a Loyal Adventurer or a Doppelgänger, with the number of the latter ranging from 1 to 3 depending on the number of total players. 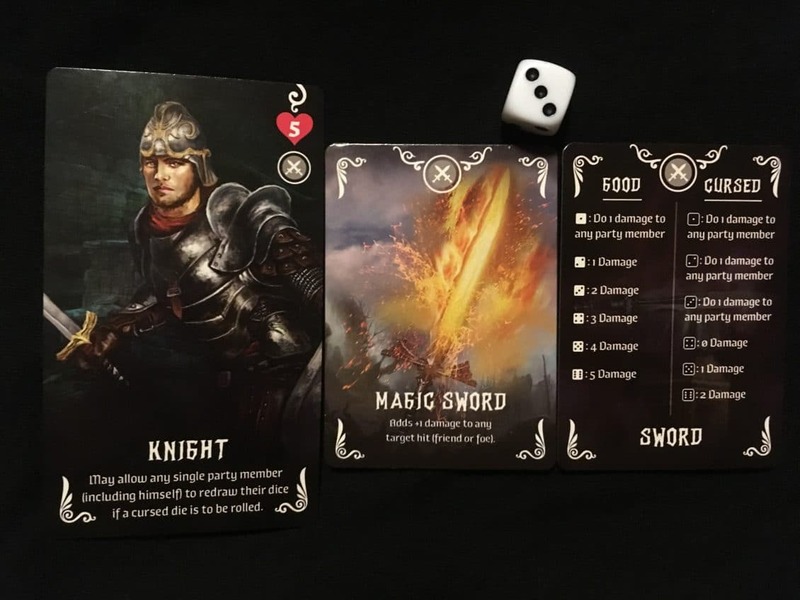 A Quest card is flipped over by the Party Leader and everyone at the table passes an Item card from their hand to the person on their left. This is an interesting step because while everyone can use Dagger, Spell, and Elixir cards, the Sword, Bow, and Staff cards are class-specific. This is also where the Doppelgänger can begin their sabotage…even if they’re not selected to go on the Quest!. 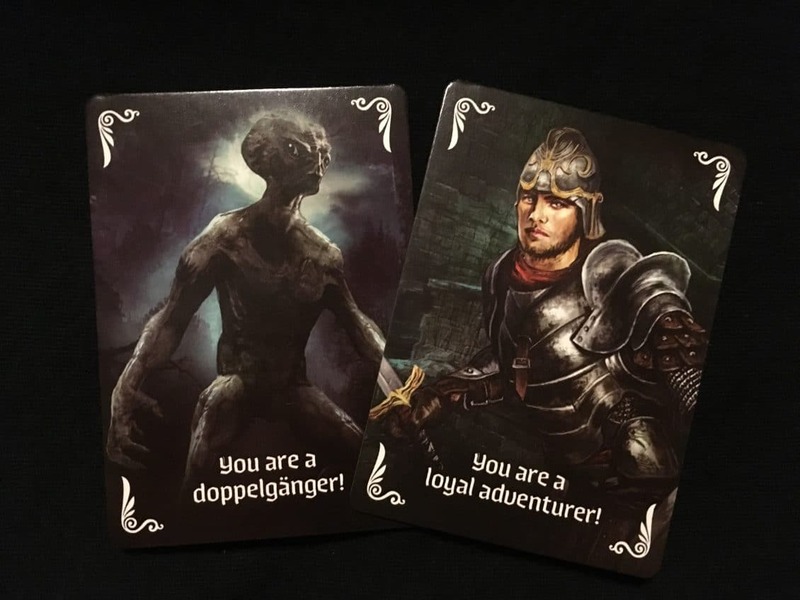 The Party Leader does not select their party until after this step, so even if you know who the Doppelgänger is, he or she can still try and cripple the cards available to the party. Very nice touch here! After the party is compiled, they each play a single Item card from their hand in an effort to meet the Quest’s condition: Dealing either a minimum amount of damage or damage within a finite range (say 8-10). These cards are turned in facedown to the Party Leader who then draws two more Item cards from the draw pile into that stack and shuffles it before blindly discarding one. They can then survey the cards at their disposal and hand one to each player on the Quest before discarding the last card (again face down). This mechanic gives the Loyal Adventurer Party Leader a chance to avert sabotage while also masking the Doppelgänger’s nefarious play. And if the Party Leader IS a Doppelgänger, they’ve got a unique opportunity to blame the bad luck on the random draw! If you play a card that matches your character’s icon (Sword, Bow, or Staff), you then reach into a bag that conceals 3 dice – 2 black (Cursed) and 1 white (Good) – and draw two secretly. 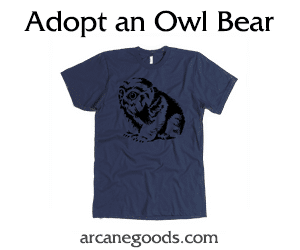 You replace one (again, out of sight of everyone at the table) and roll whichever you choose. Low rolls on either color die is bad news, but the percentages are different for the Cursed and Good dice. Anything but a 1 on a white dice is going to help the party, but you have to roll a 5 or higher on a Cursed die to do anything that could be considered helpful. This helps mask the Doppelgänger a bit further as the odds are technically in their favor on this step. Some who roll the black dice will have ill intent. Others will just have bad luck. Only the discerning will be able to tell! But even neater still is the fact that a Loyal Adventurer might actually choose a Cursed die in the hopes of dealing damage to the party member of their choice. But they better know who the Doppelgänger is, or this strategy will result in their defeat! Successfully beating a Quest means the Party gets the Rewards listed on the card and get to flip over one of the 6 Light tokens (hopefully revealing one of the 3 Artifacts of Light). Losing usually results in damage and other penalties like the loss of reroll token, and one of the 6 Darkness tokens is flipped. Damage is done “ping pong” style, which adds yet another fun twist to gameplay. The Party Leader retrieves damage tokens equal to the damage listed on the Quest card and chooses which party member (who tended to the Quest) gets 1 of those tokens. They then pass the tokens to the player who took that damage and that player does the same (chooses a player – including themselves – to take a damage who then gets to select the next, etc) until all tokens are dispensed. So Doppelgängers can get swarmed in this stage of the game if they’re discovered, but they’ll get to mete out some damage, too! The Doppelgängers win if any one of the Loyal Adventurers dies by dropping to 0HP at any point during play or if the 3 Darkness Artifacts are revealed. The Loyal Adventurers win if a Doppelgänger is dropped to 0HP or the 3 Light Artifacts are revealed. In The Thing, you could rat the Infected out with a Blood Test and maybe even torch them. Not so in Doppelgänger. If you want to kill them, they have to be with you on Quests. This, of course, carries obvious risks. Sure, you could leave them at the Tavern where they can heal up a bit (a mechanic and option open to all players), but they’ll still be able to try and wreck the hand of Items of their neighbor. Many of the Quests also require you to deal out quite a bit of damage to win, so leaving them behind is a risk of a different kind. Gives you a means of slowly but consistently whittling the HP of any suspected Doppelgängers down to 0 just by forcing them to go on each Quest. Makes you think about party composition even if you’re sure who the good guys are as they, too, risk dropping to 0 – a win condition for the Doppelgängers! The deduction element of the game is very, very high – a major pro in hidden role games. And there is some serious juggling of priorities inherent in play. You’ve got to keep the good guys alive while simultaneously trying to kill the Doppelgängers; managing damage dealt and health restored as carefully and strategically as possible until one of your team’s winning conditions is achieved. Doppelgänger is a really great game! Designers Steve Avery and Robert Burke play up the fantasy elements in the art (which is gorgeous across the board!) and the gameplay elements really well. And while it is easy to learn it also boasts a fantastic amount of strategy for both the Doppelgängers and the Loyal Adventurers. I thoroughly enjoyed Doppelgänger and it comes highly recommended from me. It is an absolute steal at $25 as far as I’m concerned. Add it to your collection today!